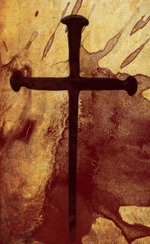 mini ministry: believe because you know Him :: sharing the Way, Truth and Life in Jesus Christ: Resurrection Day 2011: WHY? do bad things happen to good people? Resurrection Day 2011: WHY? do bad things happen to good people? The truth is, none of us have or even can. There are no good people. Except, that is, for one. Ironically, horrible things happening to this good Person are exactly what Christians consider at Good Friday each year. Jesus Christ, the only Man who never sinned, willingly took on His people’s sin as He died. The only good Person to ever live was crucified and, on the cross forsaken by God so His people wouldn’t be, He quoted the first part of that Psalm above. I understand the bumper-sticker "cleared myself of the question" defining everyone as bad, and I don't necessarily disagree on the angle that you're taking, but isn't this question usually asked from an emotional position and not as an intellectual one? We ask this when a loved one dies too young, or a Dad loses his job. Sometimes bad things have even happened to people who have been redeemed by Jesus sacrifice on the cross. Cris, certainly the standard issue question is often asked emotionally in times of crisis. However, I have posed two questions: The big, emotional question, "Why?" and the second, "Do bad things actually happen to 'good' people?" by which I desired to draw out the Gospel in a way many to whom I have spoken tend to miss. Regarding the emotional, as noted, bad things happen to everyone without exception in this broken world, and there is terrible pain (of which many friends and I have known much these past few years). Yet even as we go through these things, believers can rejoice in that we have not only a Redeemer from sin but One who is bringing restoration to our world. I pray our focus, regardless of circumstance, remains on what Jesus has done, is doing and will do. I have a simpler Explanation. Bad things happen to good people because misfortune does not discriminate on the basis of good deeds. Bad things happen to good people because probability does not exclude them.